The simulation took 54227.9 seconds in CPU time. 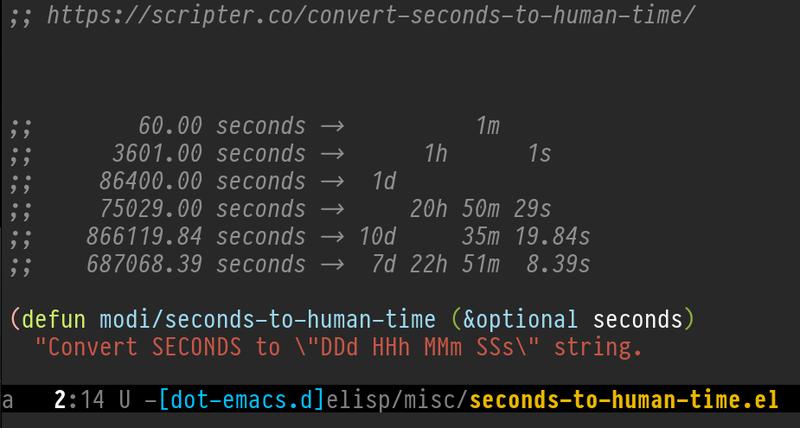 That triggered me to write a “little” script to convert seconds to human time i.e. time in days, hours, minutes and seconds. Thanks to /u/xiongtx from Reddit, I learned about the built-in function format-seconds that does what I wanted to do – but not exactly in a way I wanted to see. Though, format-seconds gave me an idea for a big optimization (code commit diff). Below Code section is updated to reflect that. If you like, you can review older version of the same section at the end of this post. Also, at the end, you will find a comparison between the outputs from format-seconds and modi/seconds-to-human-time. "Convert SECONDS to \"DDd HHh MMm SSs\" string. SECONDS is a non-negative integer or fractional number. when this function is called recursively. extracted from that, else the user is prompted to enter those." "Return string representation of TIME. well-formatted manner instead of returning it." (message "%0.2f seconds → %s"
;; calls to this function. ;; re-entrant executions, return the `time' list instead. I did not always want to prompt the user to enter the input argument. If a region was selected, the function assumes that the user selected a number, and skips the prompt step. So I used a plain (interactive) form instead of using (interactive "sPrompt: ") or (interactive "r"). See (eintr) Interactive Options and (elisp) Interactive Codes to learn about interactive and its codes. Also interesting is the fact that these let-bound lambdas can have their own doc-strings too. I make use of recursion in this function! But I needed this function to return a string (using that gen-time-string function) only when all the nested calls to itself were returned. So to distinguish between a direct call to the function, and re-entrant calls, when doing the latter, I make the input number a list of that number. So while the function might take an input number like 7 for a direct call, that same number, when needed to call to a recursive call, would get passed as (list 7) or '(7). If you glance back as that little snippet above, I return the time as a string only if the input seconds is a number — and not a list i.e. only when I am in the “direct call instance”. The internal variable time is now an alist and can have up to 4 cons elements. Each cons is of the type (TIMEVALUE . TIMEUNIT). So time now looks like ((DAYS . "d") (HOURS . "h") (MINUTES . "m") (SECONDS . "s")). If the input seconds is 7200 seconds i.e. 2 hours, I cannot allow time to be just (2), because then I wouldn’t know the unit of that 2 (2 days? 2 hours? ..). With the above technique to tag the time value with its unit (inspired from format-seconds), the time value will be set as ((2 . "h")) instead. That way, it would read clearly as 2 hours, 0 minutes, and 0 seconds. Back inside gen-time-string, I then skip printing the time units that are 0 (unless everything is 0, in which case I print "0s"). So instead of printing "1d 0h 0m 5s", it would print "1d 5s". The test generator did not need to be updated, because the code optimization was completely internal — Return values were not affected. A code isn’t complete without tests! As much fun I had writing the above function, I had equal fun in writing its little tester too. frac will be either t or nil"
The test also makes use of a let-bound lambda, for the rand-bool function which I use to randomly return t or nil. The secs-rand1 is a partly randomized version of secs where one or more of the above time units would get randomly added by 1. The secs-rand2 is a totally randomized list of time in seconds where the time could be anywhere in the [0, 1000000) range, fractional times with 2 decimal places included. You can find the latest version of this code at seconds-to-human-time.el (first revision). Your car will be ready in 2h 13m 20s, and the simulation took 15h 3m 47.90s in CPU time. (message "%9.2f seconds → %s"
# fractional values (on the left) when seconds are not integers. Notice the redundant 0h, 0m, 0s on the left, and also the loss of seconds precision (the latter point is not a big deal though). ;; executions, return the `time' list instead. The internal variable time is a list and can have up to 4 number elements: (DAYS HOURS MINUTES SECONDS). The key was to always have each of those elements at their respective positions in the list. If the input seconds is 7200 seconds i.e. 2 hours, I cannot allow time to be just (2), because then I wouldn’t know the unit of that 2 (2 days? 2 hours? ..) — The nested cond logic for setting the time variable ensures it gets set to (2 0 0) instead. That way, it would read clearly as 2 hours, 0 minutes, and 0 seconds. Back inside gen-time-string, I then skip printing the time units that are 0 (unless everything is 0, in which case I print "0s"). So instead of printing "1d 0h 0m 5s", it would print just "1d 5s".